A potential source of energy savings in buildings is demand controlled ventilation (DCV), or dynamic modulation of the ventilation rate based on current occupancy. The impact of DCV on indoor air quality (IAQ) has not been investigated over a large range of indoor air processes or under the revised ventilation rate procedure (VRP) introduced in ASHRAE Standard 62.1-2004, which reduced per-occupant rates and added a constant per-area rate. A transient, multi-contaminant model of an area-normalized US office was created, and best estimates for distributions of model inputs across the US office sector were developed and used in a six city Monte Carlo simulation of dynamic ventilation strategies, including DCV and morning flushes. 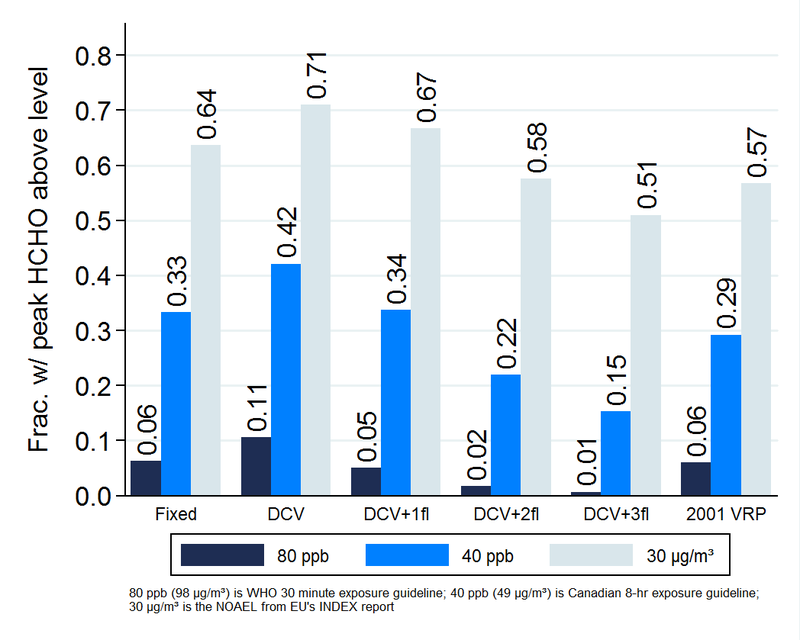 DCV implementation had a very minor effect on concentrations of ozone, particles, and carbon dioxide. The greatest effect was on daytime mean and peak concentration of total volatile organic compounds (TVOC). TVOC daytime means increased from 7–10% and peaks increased from 10–14%, depending on city. Adding a medium intensity morning flush to DCV almost completely mitigated the increase in mean concentration and reduced the peak concentration below the fixed ventilation baseline in most cases. Differences among offices due to input variations were far greater than changes observed from implementing DCV, and a sensitivity analysis indicated that the TVOC emission rate was more influential than the ventilation strategy. The distribution-based, sector wide Monte Carlo method developed here should also be useful for assessing other ventilation strategies and input parameter impacts and informing the development of IAQ guidelines. DCV increases the fraction of buildings with formaldehyde levels above various guidelines, especially in terms of the peak concentrations observed during the day. Adding a morning flush period (of single, double, or triple the area-minimum ventilation rate) mitigates this DCV impact on IAQ. Rackes, A., & Waring, M. (2012, July). Modeling impacts of dynamic ventilation strategies on indoor air quality over the United States office sector. Paper presented at Healthy Buildings 2012, Brisbane, Australia. Rackes, A., & Waring, M.. (2012). Modeling impacts of dynamic ventilation strategies on indoor air quality of offices in six US cities. Submitted.